A little more than 100 years ago, a group of young women from privileged backgrounds parlayed their status and education into public service. They called their organization the Junior League, in reference to the members’ young ages. Their dedication to public service lives on in the form of the Association of Junior Leagues International ( AJLI), a women’s volunteer network that grew from a group of dedicated New England debutantes into an international volunteer organization with chapters in the United States, Canada, Mexico and Great Britain. Founded in 1901 by New Yorker and social activist Mary Harriman, the Junior Leagues are charitable nonprofit organizations of women who make a great impact on their communities. The Leagues became an association in 1921 and joined forces today to amplify their voice for common causes, and today is known as The Association of Junior Leagues International, Inc. Its purpose is exclusively educational and charitable. It tackles some of the pressing issues of our time: illiteracy, childhood nutrition, domestic violence, foster care, obesity and many more. 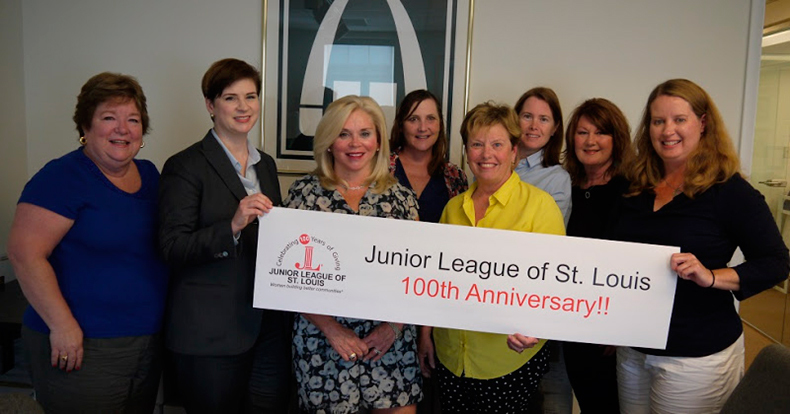 The Junior League of St. Louis (JLSL) is one division of this immense organization. They are committed to developing the potential of women and improving the community through action and leadership of trained volunteers. With approximately 600 members, they provide funding and technical assistance to the community within its areas of concentration: protecting and empowering children and women’s health and well-being. Founded in 1914, the JLSL’s mission is exclusively educational and charitable. 2014 marked the local league’s 100 years of service. Their gifts to the community of St. Louis include over $4 million dollars since its inception in 1914. They have donated more than 10,000 volunteer hours annually to the community. Among some of the St Louis chapter’s major accomplishments were a junior kindergarten program started in 1964, which was the forerunner of the nationwide Head Start program. Other long-term League projects include the St. Louis Family Theatre Series, now in its 26th year of providing children’s theater to inspire a love of reading; as well as the League Larks and Nightingales, who provide music therapy at venues such as senior living centers. Obviously an organization like this requires substantial funding. As a nonprofit, this is done in many ways. Membership dues raise some of the working capital, but other money comes from fundraising through Annual Giving, corporate gifts and planned giving. There are also many annual events, both large and small with one mission: to raise money in order to aid the community. 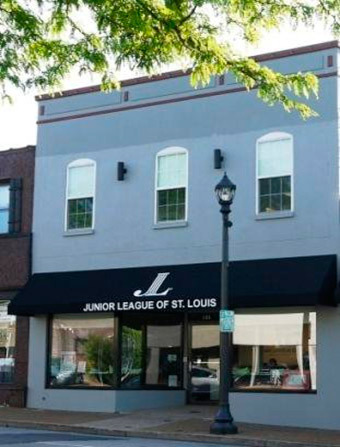 “We (also) have a variety of fundraisers, which include selling our famous JLSL Cinnamon Rolls, our cook book, St. Louis Days and Nights, Special Events, and our Home Design Tour,” offers Allison Lavigne, the Fund Development Team Lead. A fun capital- raising venue that recently opened is a retail boutique. The proceeds benefit the Junior League of St. Louis’ training and community programs. 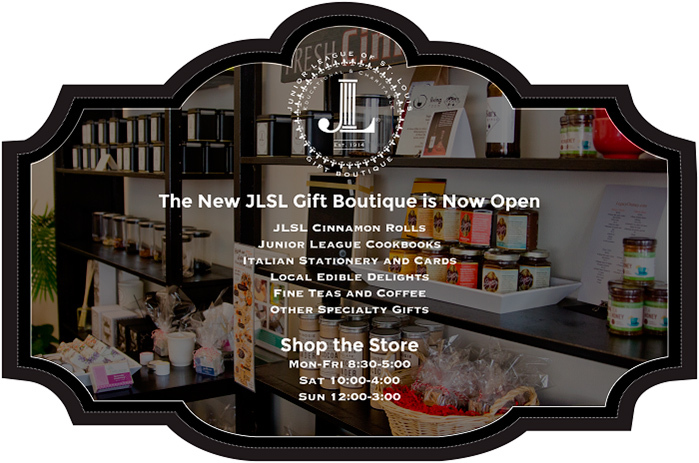 “We have always sold our famous JLSL cinnamon rolls and cookbooks, (both JLSL and other JL cookbooks) at our headquarters, but we launched this new boutique concept on July 19th last year in order to more efficiently use our retail space and drive exposure for the JLSL and our mission,” said Allison, the visionary for this store. Staffed by members who must complete a required number of fundraising shifts per year, it has become a popular venue for raising funds. “We started with products that I and the other leaders on the Fund Development Team loved , with an emphasis on filling the category of ‘hostess gifts’. 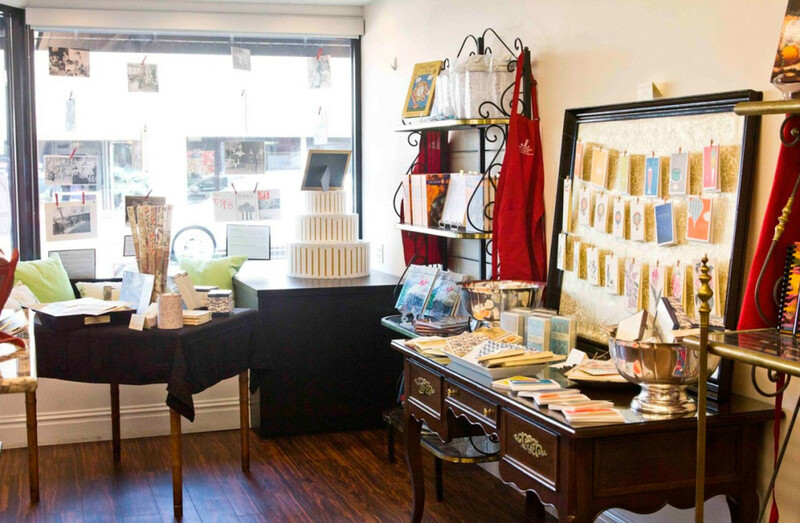 Right now we sell fine tea and chocolate, Italian stationery, inspirational greeting cards, gift wrap and tags, children’s books, and other local edible delights”. 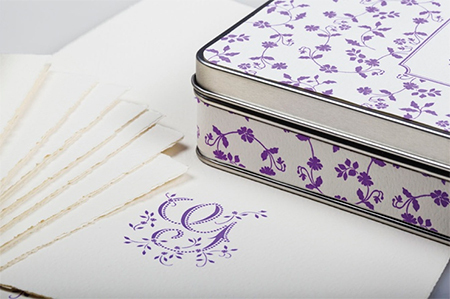 They carry several gift items of Rossi Paper including letterpress initial cards and Peacock gold foil initial sets. When asked who makes the famous cinnamon rolls, Allison says, “Members make the cinnamon rolls ourselves in a nearby commercial kitchen. 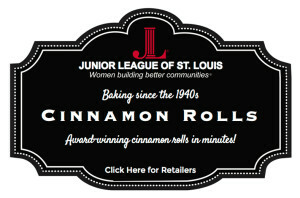 JLSL Cinnamon Rolls are sold at the JLSL Headquarters and many fine markets in St. Louis. We are hoping they begin a mail-order division really soon!